London Fashion Week is definitely growing and solidifying its place among the fashion set. To this end one of the British Fashion Council's leading ambassadors; Samantha Cameron was in charge of welcoming international participants to the event. A reception hosted by Cameron included the likes of Anna Wintour, Diane Von Fustenberg, Donatella Versace and Selma Hayek as well as some of Britain's top fashion players. From our select reviews below, it is obvious that the fashion expressions streaming from the London runways were worlds apart. Almost makes one wonder are these designs really for the same season? This collection was a walk on the wild side with an assortment of hot animal prints. A great choice for any fabulous femme. 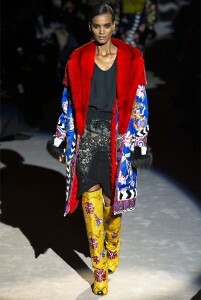 Fun funky fashionistas should enjoy the abundance of these garish prints which dominated this line. If Paul has anything to say about it, color will be in full swing come fall. From flowing gowns on knee length skirts and everything in bewteen, sleek and ladylike was the theme on this runway. Rihanna's collection for River Island received mainly negative reviews and was deemed a reflection as of the songstresses style.